You have been deceived...by magazines, newspapers, the digital media, by artists, school teachers, and yes, even children's books. And it will stop here. 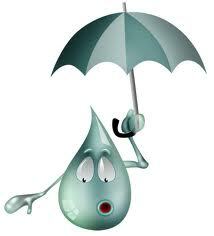 The problems is that raindrops virtually NEVER look like this! Northwesterns like us, with our persistent wet weather, should be expected to be fully educated in raindrop-ology, and thus this blog may serve as an important public service. Perhaps the Mayor will establish a raindrop education day this year. Why spherical? Surface tension--the attraction of water molecules to each other--pull the molecules together into a ball. Furthermore, small droplets don't weight that much and their fall velocity (also known as the terminal velocity) is relatively small, so the disturbing influence of the air moving around the droplets is minimal. I bet you have all noticed the difference in fall velocity of various size raindrops: drizzle drops seem to slowly drift down while big rains come down REAL fast. For bigger droplets (2-3 mm), their weight causes them to fall faster, and the greater speed of the air passing around them causes them to be distorted into a pancake shape, with a nice little dimple in the middle. For really big droplets, the distortion caused by the fast moving air is huge...the droplets get hollowed out into a parachute-like shape. 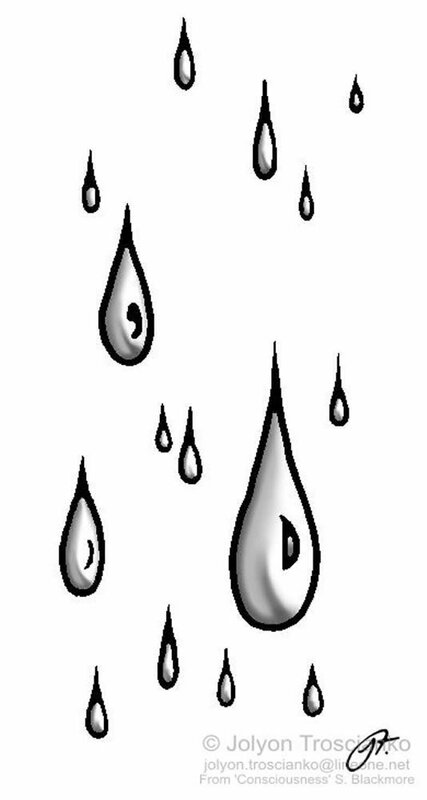 There is a limit to how big a raindrop can get because eventually the aerodynamics forces of the passing air tears it apart. 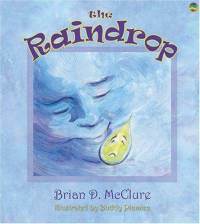 What is the biggest raindrop ever observed? Well my University of Washington colleagues (Dr. Peter Hobbs and Art Rangno) may have seen the largest---8.8 mm (.35 inches!!) --in tropical cumulus. 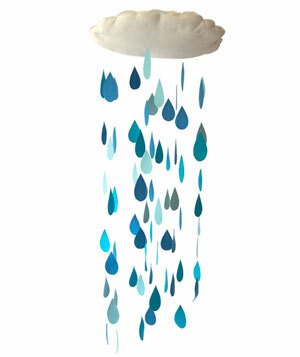 Imagine being hit by such a giant raindrops! One final thing--our newly upgraded weather radars, with their fancy dual-polarization, have the capability to measure the shape of precipitation, including raindrops. 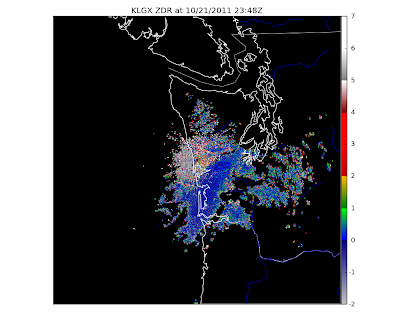 Here is an example--the zdr product (stands for differential reflectivity). Zdr measures the difference in return between an up-down and side to side view of precipitation, thus giving information on the shape. When the returns in both directions are roughly the same (the difference between them being nearly zero), this product gives a value near zero. If the precipitation gets distorted, the number increases. 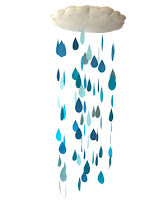 Pretty neat stuff--measuring raindrop shape remotely. Looking at the image below, you can see a lot of near zero (blue) colors....not many teardrops here! The area of large values (white/gray colors) near Hoquiam is not meteorological--its ground clutter, where the radar beam is hitting the surface. Finally, for those voters in Seattle, please keep in mind the Seattle School Board race and necessity to replace the current board members with those committed to better math education in our schools. The math textbooks used in Seattle are terrible at all levels and I see the impact on Seattle students coming to the UW--many of them have very weak math skills. We can do much better, this requires school board members that are willing to deal with the issue--the incumbents are not. The challengers (Peaslee, McLaren, Martin, Buetow) are all committed to dealing with the problem. The latest school board poll is here.